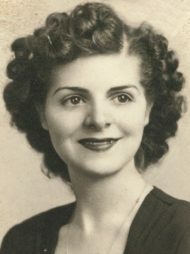 Carmella “Dolly” Mazzarese, formerly of Johnstown, PA, passed away at Moravian Manor in Lititz, PA on March 22, 2019 at the age of 95. She was born in Boswell, PA on June 30, 1923, to the late Michael and Marie Perry of Johnstown, PA. Dolly shared 59 years of marriage with her loving husband, the late Peter Mazzarese, until his passing in 2005. Dolly was a 1942 graduate of Johnstown High School. She shared a family business with her late husband called PM’s Market. After moving to Lancaster in 1981, she worked for Watt & Shand for 14 years. Dolly enjoyed sending greeting cards of all kinds to family and friends, baking, and crocheting. 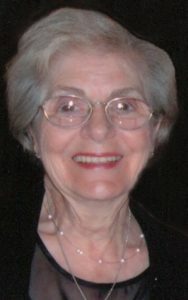 She enjoyed being surrounded by her children and grandchildren. A woman of strong Catholic faith, she was a member of St. Anne’s Catholic Church, and later St. John Neumann’s Church. Dolly is survived by her three children: Anthony Mazzarese (Margaret) of Lancaster, Marie Pallagi (Robert) of Scottsdale, AZ, and Joann Flouras (Peter) of Lancaster. Also surviving are six grandchildren, Michael Pallagi (Mindy), Peter Pallagi (Mary), Michael Mazzarese (Lisa), Jennifer Roth (Greg), Julia Flouras and Constantino Flouras; six great-grandchildren, Ella, Lucas and Logan Pallagi, and Luca, Mya and Isabella Mazzarese; a sister, Vita Giannone; sisters-in-law, Mary Louse and Rose Perry; and numerous nieces and nephews. In addition to her parents and husband, she was preceded in death by sisters Genevieve and Grace, and brothers Michael, Frankie, Dominic and Ernie. A viewing will be held from 6-8 PM on Tuesday, March 26, at the Charles F. Snyder, Jr. Funeral Home & Crematory, 3110 Lititz Pike, Lititz, PA 17543. The Rosary will be recited at 7:45 PM. Family and friends will also be received from 10-11 AM on Wednesday, March 27, at St. John Neumann Catholic Church, 601 E. Delp Road, Lancaster, PA, 17601, where a Mass of Christian Burial will be held at 11:00 AM with Rev. Dan Powell as Celebrant. Entombment will follow at Conestoga Memorial Park. In lieu of flowers, contributions in Dolly’s memory may be offered to the Benevolent Care Fund of Moravian Manor, 300 West Lemon Street, Lititz, PA 17543. I was sorry to see the news about Carmella, my condolences. I had the pleasure of working with her for many years when I worked as a Dental Hygienist at Loeffler-Pitt Dental. In between taking care of her dental care we had some nice conversations and she kindly gifted me some of her crochet work over the years. I was aware of how much she missed her husband which saddened me. I trust they are reunited. Thinking of you during this difficult time. Dear Anthony and family. So sorry for the loss of your beloved mother. You are in our thoughts and prayers.